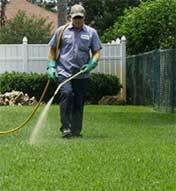 Fertilization is an important practice that helps to maintain a healthy and happy lawn. Our slow release fertilizer will keep your grass looking green and lush throughout the season. It gives the turf the proper nutrients to grow and our weed control system will ensure your lawn isn't over run with invasive weeds. Our mixture is child and pet safe as soon as it dries, so you can rest assured that your loved ones are safe! Below we outline the 5 applications that we apply throughout the season. 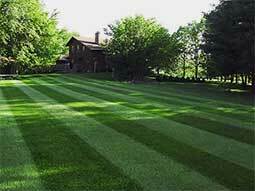 By feeding your lawn throughout the growing season, you can maintain optimal grass health and weed control. 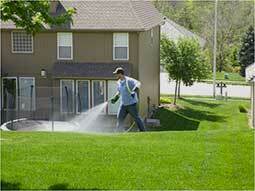 Your search for a Cheyenne lawn fertilization service ends here. Sign up here for our 5 application fertilization and weed control program! The first application is applied as liquid and contains fertilizer and control for broad leaf and dandelion. We also spot treat for weeds such as dandelions, clover, blue bell, etc. during this application. During this time a pre-emergent can be applied to rock beds and other landscaping to avoid greater weed problems throughout the season. This is generally applied during the spring season before summer begins. The second application is applied as liquid and contains fertilizer and control for broad leaf and dandelion. We also spot treat for weeds such as dandelions, clover, blue bell, etc. during this application. This application is applied early summer. This application and the first are critical for getting weeds under control before they take seed. The third application is generally applied in granular form and contains a fertilizer mixture combined with control for broad leaf and dandelion. We also spot treat for weeds such as dandelions, clover, blue bell, and other weeds during this application. This application is applied mid-summer. The fourth application is applied as liquid, contains fertilizer and control for broad leaf and dandelion. We also spot treat for weeds such as dandelions, clover, blue bell, etc. during this application. This is applied late summer. The fifth application is applied in granular form, contains fertilizer designed to strengthen the root system, and helps prepare the grass for the dormant season. This application is applied in the fall, generally early to mid October. We also spot treat for weeds such as dandelions, clover, blue bell, etc. during this application.